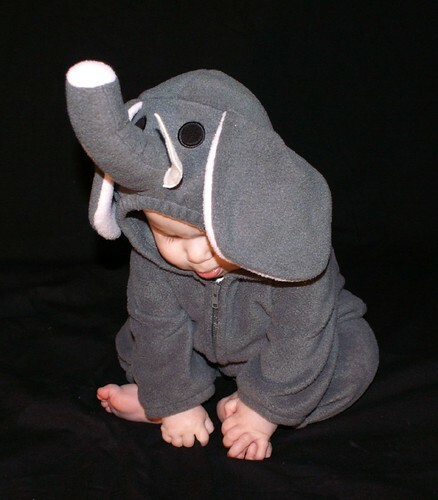 I was lazily checking my email–er, whoops, uh–scrubbing my kitchen floor with a toothbrush for the fifth time that day (that’s how I keep it so shiny), when lo and behold a baby ELEPHANT walked through the front door. “What do you say? Will you stay with me?” I pleaded with a big friendly smile. “Um, is that a raspberry?” I asked with surprise. “So, does that mean you’ll stay?” I hoped brightly. 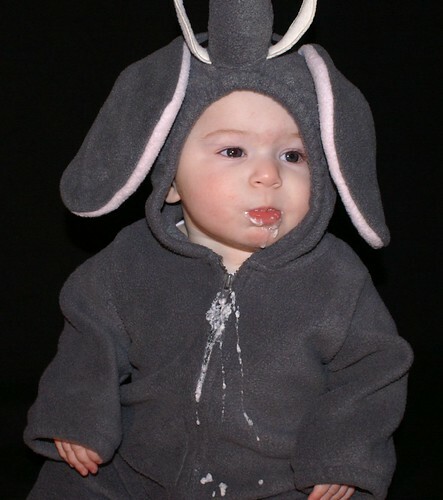 And then all of a sudden, the baby elephant spit up! “You’re my Bubbers!” I exclaimed with glee. Happy First Halloween, Mr. Bubbers Man! Great job, Love! That was so fun to read and those pictures are really cute. How cute!!! 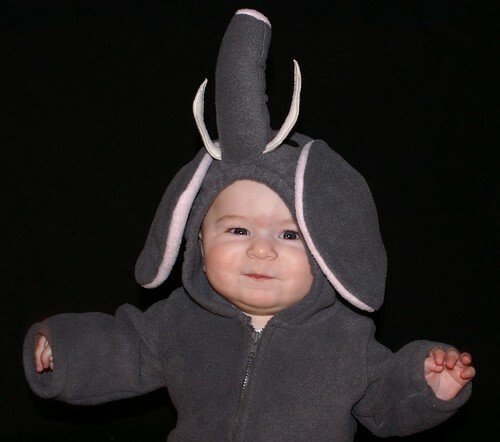 That is an adorable costume!! Little kids in costumes are the best! –Thank you for visiting and commenting! –Aw, thanks for thinking he’s cute! I have to say, this was the first Halloween I’ve been excited for in a long time, because I knew I was going to get to dress him up and take pictures. :):) Kids definitely add a whole new fun level to holidays. 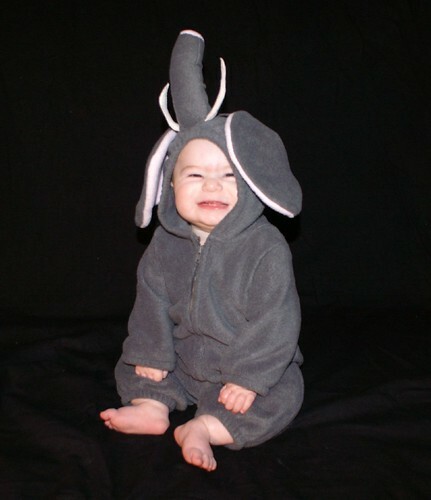 what a cute elephant!!!! i’m so glad you finally reconized him as bubbers! 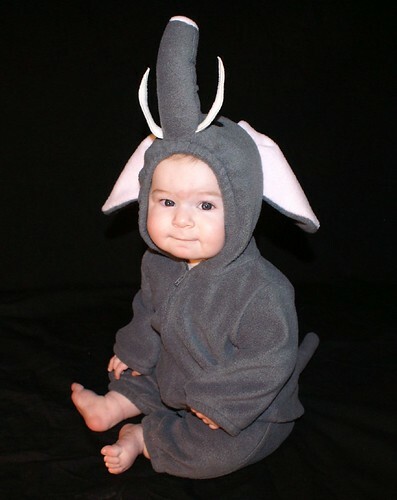 j/k very cute story to go with the pictures, hope he had a fun halloween. –Thank you! I was so happy with how it turned out (I wasn’t sure it was going to fit, but then it did). –He had a pretty mellow Halloween. 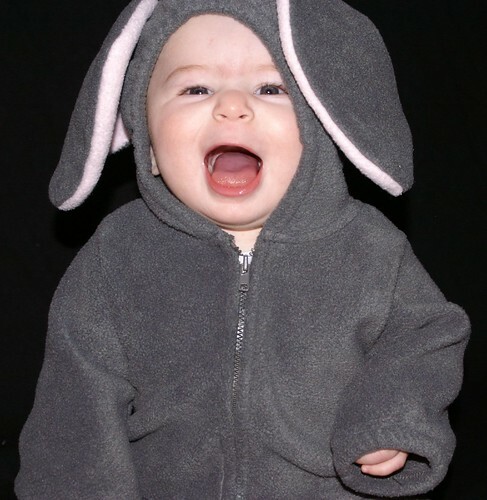 When Daddy got home, we put him in his costume and paraded around the living room for a little while. Then we took some pictures and Bubbers was ready to be done. 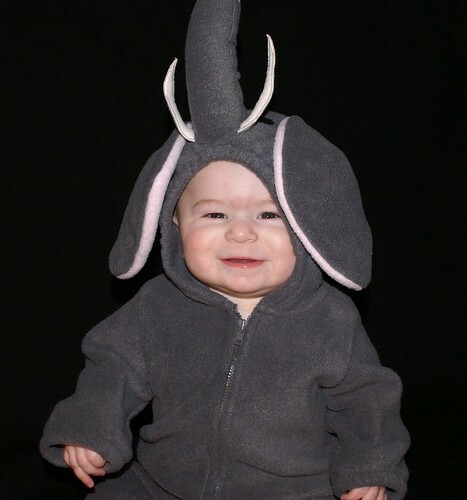 :) He was sure cute, I felt bad for him that he was sick for his first Halloween. Oh, well. Cute story and costume. How was halloween? 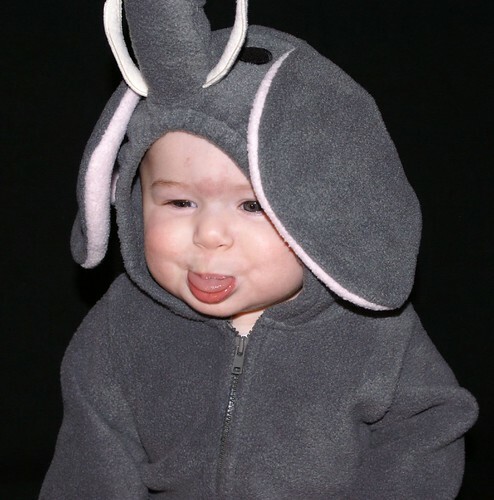 –We were going to go to our ward’s trunk-or-treat, but with his ear infection, Bubbers wasn’t up to it. I almost took him, but realized it would have been more for MY enjoyment than HIS, so we stayed home instead. –Thank you, so do we! :) He’s almost over it, I think (though it’s hard for me to tell, since it’s his first one). –Halloween was fun. We had a few trick-or-treaters (our first ones ever! ), which was awesome. 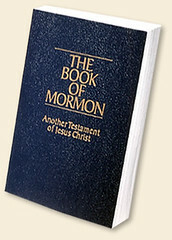 One little boy turned back as he was leaving our door and called, “Thank you! Have a great Halloween time!” You could tell he wasn’t sure what to call it, and that’s what he ended up saying–I loved it! Kids are the best. Hey Heidi- Thanks for your comment on my site the other day. Bubbers is such a cute little guy! So expressive! 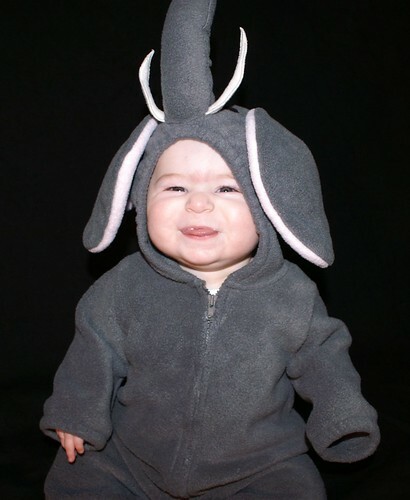 And he makes a great elephant! –Thanks for thinking my son’s cute. We sure enjoy him and his fun expressions! Oh my! SO SO SO CUTE!!!! I love the hood! With the nose! Doesn’t it make you want to just nibble on him? –Thank you! Can you believe that costume? When I pulled the hood on, I loved how the nose stuck straight up on top of his head! SOOO Cute! He’s a keeper! Kimberly has started the raspberry thing too! Everything is soaking wet now. What do you do? Don’t you love being a mom!? –Aren’t raspberries so fun? I love it! The other night he made me laugh outloud when he suddenly did a raspberry right in the middle of eating his baby cereal. The cereal went everywhere and I just kept laughing it was so darn cute! Maybe that’s why he threw up? Thank’s for the visit to my blog. Awww, you are so sweet! You totally made my day, thank you! Hi Heidi! First time on your blog. And you have the cutest little boy there. That costume is AWESOME. Love all the photos. I’m going to check out the rest of your blog now. See you again! Hello and welcome to my blog! Thank you so much for your comment. 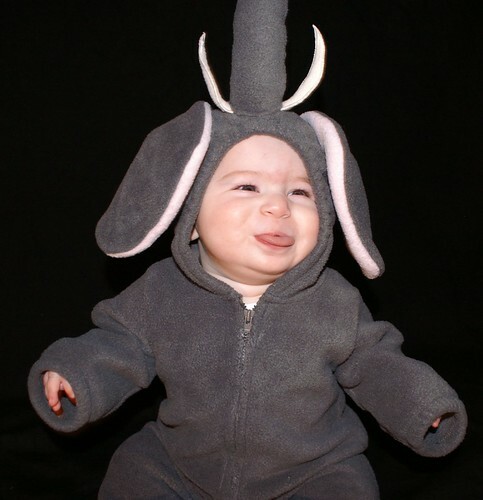 I’m so glad you think my son is cute and enjoyed his costume! :) I hope you enjoy the rest of my blog, too, and come back often.